Home / Blog / Merriest Christmases or Christmas’s? The rule is simple: never use apostrophe-s to create a plural (Okay, the exception is with letters and abbreviations that would be confusing without one: p’s and q’s, ABC’s). Apostrophes are for contractions (e.g., isn’t, we’re, don’t) and possessive nouns (e.g., Bob’s cousin, our nation’s flag, Santa’s list). 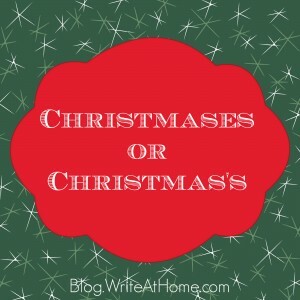 Since Christmases is simply plural here, and not possessive, just add -es: Christmases. Comments on blogs are like Christmas presents! Leave yours under the tree…I mean in the reply section below. Thanks for the answer. I hate spelling, of course I was never good at it, so the spell check is a life saver along with nice folks that answer such simple of necessary questions like this one! I wish you the very Merriest of Christmases! I notice this error with apostrophes on stones in family yards: the Feaster’s instead of the Feasters. And it’s pretty hard to edit a stone! During the Christmas season, I try to count how many Christmas cards we get that DON’T refer to the family in the possessive instead of the plural. Every year, we get so many cards from the Smith’s and the Robinson’s and the Kazanowski’s… it’s become a sort of joke in our family! Good point. It’s a very common misuse of the apostrophe. Leave a Reply to Sophia Click here to cancel reply.